Students - Yesterday I had a conversation with my friend Jackie about spending lots of time outside. I didn't realize how deeply the talk had settled into my bones, but it had. For last night when I sat to write, this is what came out. We are going camping soon too, in a cabin, and I can't wait to just spend time by the fire, under the stars with my family. To write today's poem, I just followed my mind. I allowed the poem to come to me instead of going off searching for the poem. Sometimes just settling down and listening to yourself is the best way to begin writing. Maybe that's the always the best thing to do. Before writing, take a few good breaths and just listen to you. You'll notice that each stanza of today's poem begins with the same first two lines. And the ending, well...that is my favorite part. I had played with a few different endings: endings about peeper sounds, endings about cozy toes and campfire-smoky hair, but those endings just did not feel right. Then I realized how much I love sleeping outside. And I asked myself why. See, whenever I sleep outside in a tent, I want to ALWAYS sleep in a tent. There is something magical about that feeling, being so close to nature, just a fabric wall away. The ending, like the subject, approached me. And I let it stay. Today I am so happy to welcome third grade teacher Rosanne Kulikowski and her students from Klem South Elementary. I have had the privilege of learning about writing with Rosanne for the past few years, and it is great fun for me to be able to share her class's project here. In room 205 at Klem South Elementary, we love poetry! Last December we immersed ourselves in it. The children loved Amy’s poems and enjoyed The Poem Farm. We always had to read about what inspired her to write each particular one. 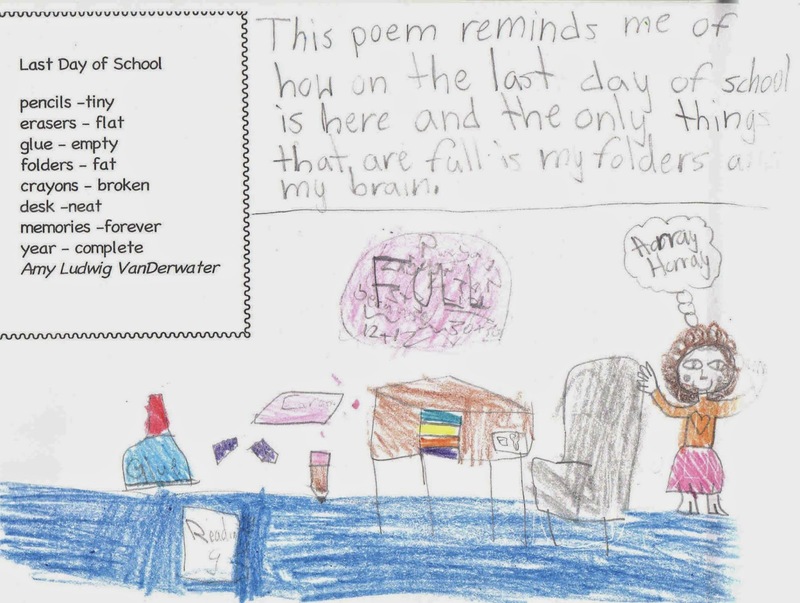 Each of Amy’s poems in turn inspired students to reflect and connect poetry to their own lives. With all of the enthusiasm around these poems, I decided we would make special holiday calendars for parents, each with a child’s reflection and illustration for one of Amy’s poems every month. I was especially touched by how each poem brought out a personal meaning to every student. Their illustrations were like small snapshots of their imaginations. Below each poem/illustration/reflection was the calendar grid with holidays and family birthdays filled in. The students not only loved reading and writing poetry, but were so proud of their gifts! Click to enlarge these calendar pages by Sara and Isabella. Thank you to Sara and Isabella and to their teacher Rosanne Kulikowski for sharing these calendar pages and this neat idea here today. Today I am tickled to announce that Shane Couch, self-professed notebook addict, is sharing his addiction with us at my other blog, Sharing Our Notebooks. Visit, read Shane's inspiring post, and perhaps win a new notebook for yourself! If you are interested in sharing your own notebooks at Sharing Our Notebooks, please just contact me here. Diane is hosting the Poetry Friday roundup this week. Stroll on over to Random Noodling to find an always-rich assortment of poetic goodies for the days ahead. I'm not a big fan of sleeping outside. Haven't done so in years. But love your poem! Who else could do such a great rhyme with s'mores! The calendar project is a great idea I may think about stealing for next year. 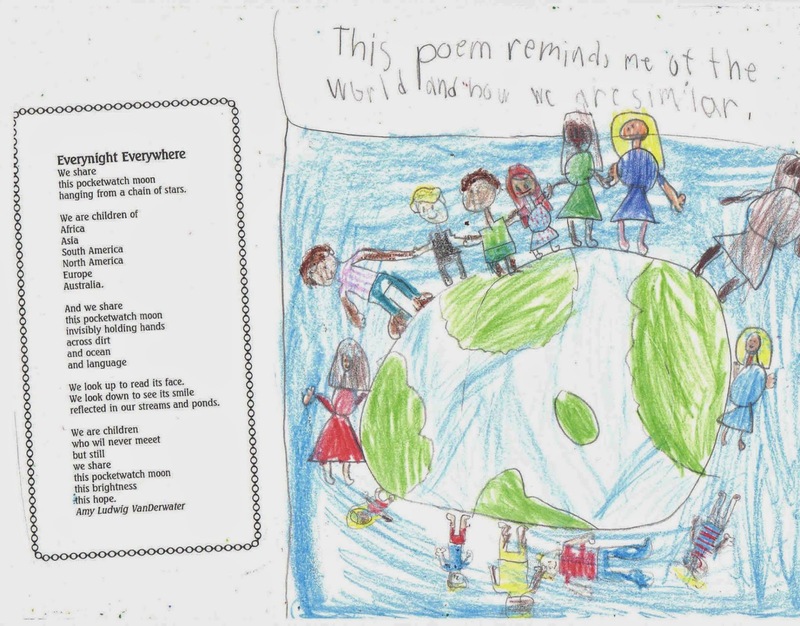 You must be filled with pride to see the children's reflections on your poems. 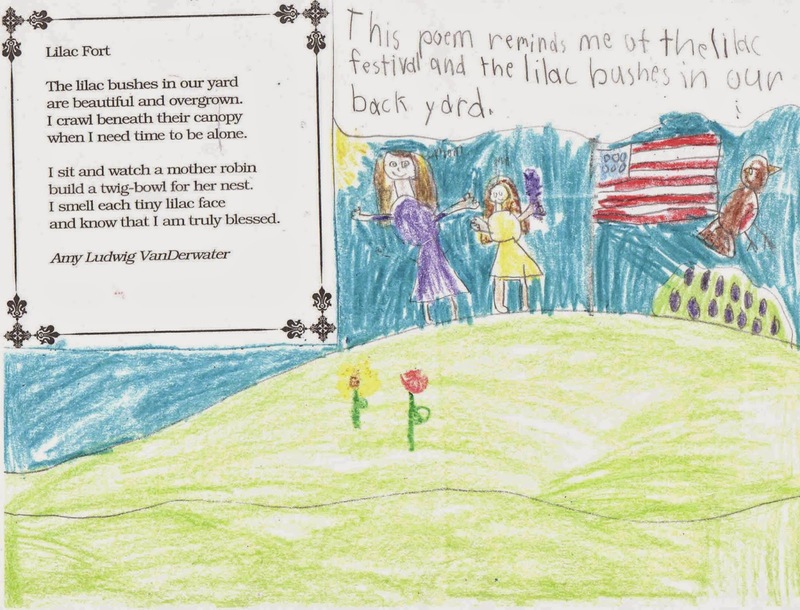 I'm always amazed by how elaborate children's pictures are. It's nice to be young and not afraid to let it all out. Adults generally reduce everything to stick figures. What a loss for us. I loved camping in tents as a kid, but as a grown-up I admit I like a travel trailer better! You capture the wonder of feeling more kinship with the universe so well in this poem! Such a charming poetry calendar!! Your "Last Day of School" really struck me. Wow! What a special way to mark the passage of a year; such wonderful art to bring your words to life. Tents are too much fun, especially when graced by a "slice of moon." Thanks for sharing! Thank you for sharing the work of these children. I'm always so inspired by their work. I love your poem. It reminds me that my tent has not seen use in several years. I may just need to get it out, even if it's only in the backyard. Oh my goodness, I want to go camping, now! 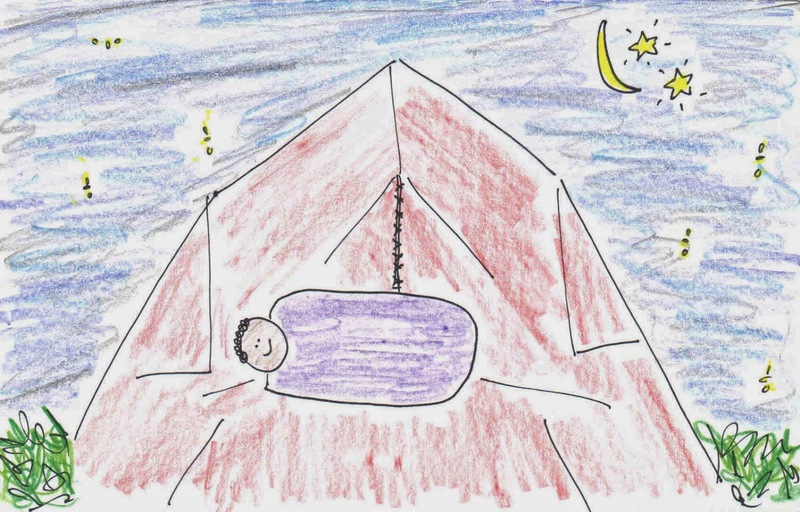 You really evoked that happy tent-sleeping feeling for me. Yay that summer opportunities are coming soon. I love how you described allowing poems to come to you. I find that works with other types of writing, too. Over at my book's web site I am at the end of writing a post every day for the month of May. Near the beginning I had some worry about how I would do that. I have found that the topic has come to me every day. Sometimes it almost insists. I would think I didn't want to write about the one popping into my mind, but eventually I'd find myself writing about it. Now I readily accept it and see what happens. So many lovely connections to your post! My family camped across the country every summer. Early on we had a tent, but soon graduated to a trailer. Back in the mid-50s we were probably the only ones in our small city who had one and people would stare as we headed off for our adventure. What terrific experiences our parents gave us. They are more treasured every year. Also creating a poetry calendar was a huge part of the way I figured out how kids love and can learn from poems and poetry recitation and more in class. So seeing Rosanne's idea truly hit home! I have some questions so if you can give Rosanne my email address, Amy, I would love to ask her a couple of questions. Now off to the journals! I want to come with you two or three or four, Mary Lee! Thanks for sharing your cute poem. Camping is no longer on my list of things to do, but I enjoy being reminded of the fun it was when I was very young. Yes, that is what it felt like long ago when I camped! 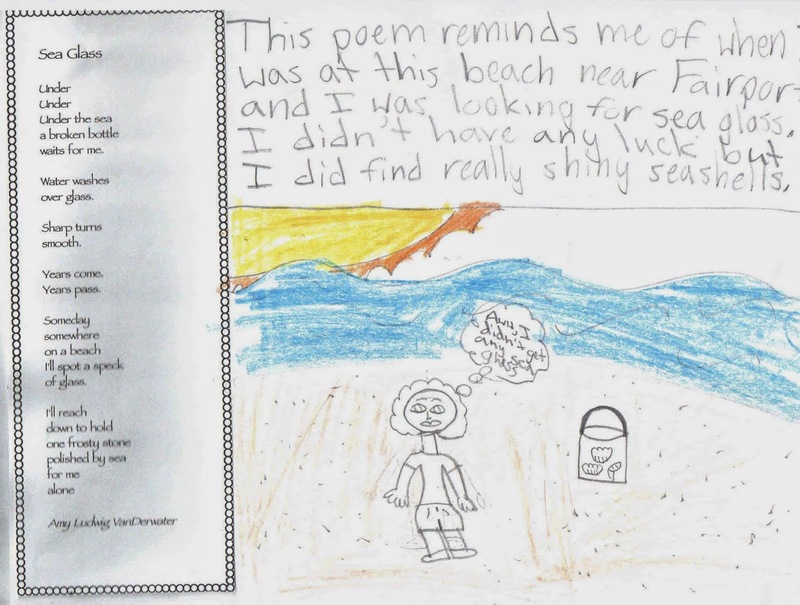 Thanks for sharing the student responses, too - love the ways in which kids dive into poems and their memories. I mostly camped outside with guides and I'm thrilled my son does it witb cubs because we haven't really done it as a family though we did borrow a tent and camp in the backyard once. We went caravaning a lot. I love that you put heartfelt feelings in the poem. It sounds lovely. Great idea for students to write about your poems. I loved your tent poem and the tribute students paid you with calendars of your poems. June 28 is Great American Backyard Campout. 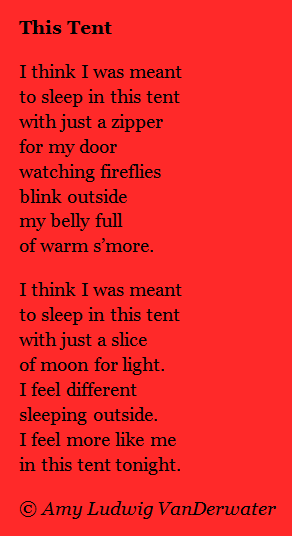 I posted a link to your tent poem on my blog of June activities. Visit http://lindamartinandersen.wordpress.com/2014/06/01/june-weddings-and-other-june-celebrations/ to see.